Emerging automotive and transportation technologies have provided revolutionary possibilities in the way we might travel in the future. Major car manufacturers and technology giants have demonstrated significant progress in advancing and testing autonomous vehicles in real-life traffic conditions. Governmental agencies are grappling with how to plan transportation systems for a world with autonomous vehicles. Past research has shown that not all technologies are immediately welcomed by the public. Autonomous Vehicles would have to likely go through a similar phase, and would need to overcome not just technological challenges but also social barriers for successful penetration into the marketplace. 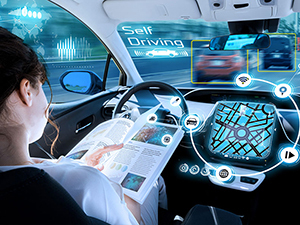 The current webinar will describe in detail findings from a multi-population survey conducted in 2015 eliciting consumers’ perceptions on autonomous vehicles, their intended adoption, and its impact on anticipated travel behavior. In particular, attendees will learn about the potential market segments of autonomous vehicle consumers, their intentions to adopt this technology, their preferences and motivations for using shared autonomous vehicles, and the impacts of shared autonomous vehicles on household car ownership. Nikhil is a Transportation professional with experience working on projects at the interface of academia and industry. He is a current Postdoctoral Research Scholar at The Center for Urban Transportation Research (CUTR) – University of South Florida. There, he works on projects in the areas of autonomous vehicles, urban mobility, and travel behavior. He received his Ph.D. in Civil (Transportation) Engineering from the University of South Florida. In addition to his extensive experience with autonomous vehicles, Nikhil has also been involved in Florida DOT’s initiatives in the fields of logistics and aviation. He also possesses expertise in data collection using stated-preference experiments. His previous experiences also include a brief stint working as a Transport Planner at the Centre for infrastructure, Sustainable Transport and Urban Planning (CiSTUP) in Bangalore (India), and as a graduate researcher in the MIT Portugal Program in Lisbon (Portugal).